Don’t want to read the article but you want to hear some awesome holiday stock music? We all love (dread?) the Holiday (stock) music season, don’t we folks? It can be as solemn as a moonlight snowfall, or as gaudy as a thousand lights on a doublewide. Tis’ the season for topical videos, advertising spots, webpage updates, and greetings of all kinds. Many of what we consider to be the standards of the holidays reside in the public domain, this means that most license catalogs will have versions of them ranging from orchestral to indie-rock. Any of our artists can try their hand at breathing life into an old familiar tune with no issues to worry about. You’ll be happy to know that ‘Jingle Bells’, ‘We Wish You a Merry Christmas’, ‘Auld Lang Syne’, and the ‘Hava Nagila’ are all in the public domain. At Tunefruit we have some fine and varied examples of these favorites, and many more to boot. Need a holiday stock music track that says “buy her a diamond, or suffer the consequences”? Try using keywords like ‘romance’, ‘love’, ‘timeless’, or ‘spouse’. You will quickly have so much pure, uncut musical sentiment you may need a glass of water so you don’t choke. Roll a little moonlit snowfall footage, or a box with a bow, and you are halfway to being a holiday hero. Most of the catchiest modern holiday songs are buried in copyright dollars, not snow. If you can’t get Sinatra singing your favorite, you can find a similar sounding track that you can easily license and use to your hearts’ content. Try searching for related keywords, like ‘sleigh-bells’, ‘snow’, or ‘gifts’, then try genres like ‘rock’ or ‘business corporate’. A large variety of very pleasant tracks will pop up, and you will leave satisfied and with your budget intact. If you want your video or site to say “holidays” without resorting to sleigh-bells or reindeer hoofs or some other obvious choice, try it from another angle. Find a stock music track that’s got a wholesome family vibe, with the type of flavor you want, like a down-home acoustic instrumental. When you pair it with imagery of a table with candles and fixins, or the oldest kid home from college with a present (and a sack of laundry), it will easily snuggle down into ‘holiday’ lane. 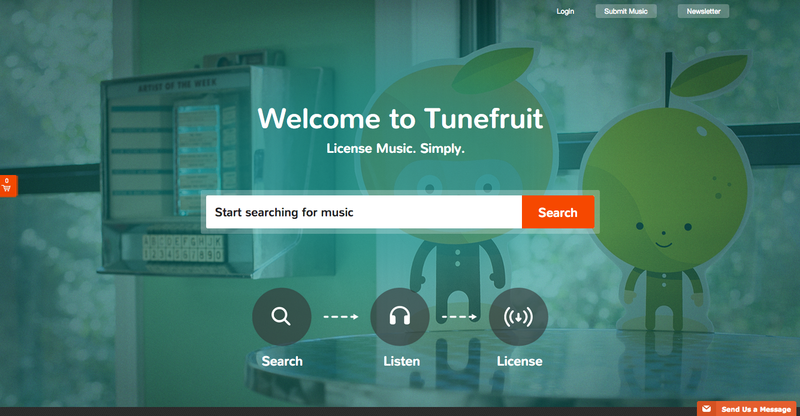 At Tunefruit we have all these options for fantastic holiday music and many more. Come explore and test them out for free. Songs so catchy they’ll hang around like Aunt Edna’s Famous Fruitcake.